If you have a Christmas wish for the world, what would it be? We are already in the most awaited time of the year. During this season most people are happy and generous. We give gifts to our family and friends and sometimes extend a helping hand to the needy. Our world needs a lot of people to be a light and guide those who are in the darkness. We all know that our world has been in chaos for so many times. This Christmas season, if you were to give a Christmas wish or a Christmas prayer for the world what would it be? If I'm given the opportunity to make one Christmas wish for this year's Christmas, I would like to wish for cryptocurrency - Bitcoin to stabilize and normalize in its price. With the current drop in the price of Bitcoin, investors are losing millions of dollars. I would wish for this to end. I agree with you. Bitcoin needs to be stabilized in its price. Cryptocurrency is a sham. There seems to be no stabilising in their value. The control is not from governments not central banks. They are controlled by blockchains. Prices will keep on flactuating. Seriously dude? This is your Christmas wish for the world? LOL, I'm kidding. I agree with you. That is also my wish for bitcoin. I have answered this question in several forums and I refuse to change my answer. I want world peace, and free Internet access! Haha, I can very well agree with you on asking for world peace because it's something that would do the world a lot of good but on the wish for free internet access, I don't think that it's something that would be possible because internet providers would make profit with their business. Hey! It's a wish list. I can wish for it, can't I? I think Santa Claus should at least consider my "toys". I've been a very good this year. 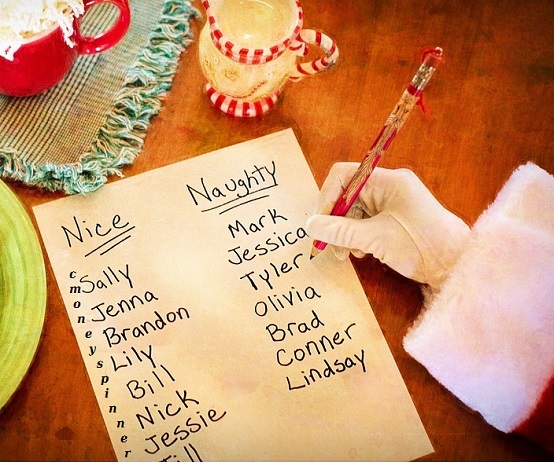 My name shows up on the Nice List. Even though it's in the margin. LOL. May your wishes can come true. I agree with you. Internet providers needs profit in their business. He has a good wish. What steps can he put in place to get free internet? Or it is just to come miraculously? In our country all public places can have access to free internet. It is a gift of our government. I always pray for world Peace even though people think this can't happen but I know it can be our portion if everyone decides to live in peace. This is free gift of nature so it really possible if we only do what will bring peace. I also pray for world peace. It will naturally come out of peaceful and loving hearts. That is great. World peace is also my first choice. It is biblical to pray for world peace. It is written in the Bible to pray for those who are in authority. That they may rule well and that their would be peace and safety for everyone. Are you fearing to break of World War III? Do not worry. The world population is escalating and should come down. On a softer note, the world should work for own peace. This question is always asked on beauty pageants, and the most common answer is WORLD PEACE. I have a feeling you're a beauty queen too in disguise, are you? However, free internet access is one that I wish for the world too. I think world peace will be achieve if we have peace within ourselves. No amount of anger or conflicts that can't resolve when peace is within us. Having a positive outlook in life will surely lessen the dark force. In peace there is respect. Forgiveness and Love. Equals unity for world peace. I agree with you. This might be common answer but it is true. I like free internet access. I wish it too but I don't know when will it happen. Considering the cost of materials and maintenance for making the services possible. It takes a good Philanthropist to make it possible. I only experience free wi-fi access in government or private institution but it's not unlimited access. Free UNLIMITED really fast internet access. Please! They mostly only give 1 hour free access at malls and hospitals here. And most of the time their internet is slow. Data is so much faster if the the mobile signal is decent. Yeah, that's the case here as well. The free internet in public places is so slow that using data is better. Pardon me if your wish is world peace because I think that is impossible to happen. If a truce or a pact of world leaders would happen today then that may be world peace but not for long because sooner or later there will be someone who would spoil the peace on earth. Anyway, my wish is for abundance of food because I have seen the news report of hungry people in some parts of the world particularly in African countries that have a civil war. Food is our primary need and people should not die from lack of food. I think it's possible to happen. If everyone would work together to achieve a common goal. Now that is impossible. Peace itself is attainable. But having everyone else to work together is the impossible part. My wish is that, to be with my parents and boyfriend again. We are separated with my parents and living without them is so hard. They live in a far province while we are here, studying. I also wish to be with my boyfriend again. We are in a long distance relationship and it is very hard. It seems that distance is really testing my patience when it comes to people around me. I just hope to be with them this christmas. Wishes should be followed with action. Work towards reuniting with your parents. Where there is a will there is a way. Maje it happen. I just hope that some children will also be reunited with their parents this christmas. Although there are some reasons why it goes like that, I hope that somehow, families can still be complete this christmas. I'm going to pray that your wish will come true. It's very hard being far from the people you love. Specially your parents if you're very close to them. You're always homesick and missing your mom's cooking. You're always going to miss that comfortable and safe feeling you get when you're near them. Being away from your boyfriend is also hard, I'm sure of it. It takes a lot of trust, patience, and understanding to be in a long distance relationship. Yes, at last, the holiday season is near I've always loved this time of the year and the main reason is you can always feel the love and joy in the air. I just visited some Christmas theme park in my local town recently and I can say that Christmas is truly here. My only wish this coming Christmas is just simple. I want all of my loved ones to be safe especially my girlfriend I don't really care about other peoples nor I don't want to wish for material things the only thing I want is safety and good health for all the people a care about. Is your fear that your girlfriend will not be safe! It is a good wish for her to be safe. This wish will come true. You should also feel other people to be safe. They are humans too. I wish the world total liberation from poverty. Poverty is really ravaging the world especially the third world countries.God should heal the land of all ravaging problems trying to consume his good handiwork. God will do it but the people should lay out steps to remove poverty. First, they should know what causes poverty and set steps in place to rid themselves of poverty. Yes poverty is one the problem in the world. I also wish that the government will find a way to alleviate poverty and to corrupt their own country. I think poverty is always a result of human acts. I've seen a lot of people who is in poverty line but never tried to work. Instead, they like to used it to earn sympathy from others. There have been a lot of successful personality who comes from the ground of difficulty but was able to achieved their dreams with flying colors. Let me borrow the inaugural speech of Pres. John Kennedy, Ask not what your country can do for you - asked what you can do for your country. I understand that life is tough and sometimes we lose our balance. But, let's not forget what our ability and capacity as a person. Prove our worth and not be lazy. My wish would be that everyone just got along even if it's just for a day. A day of no violence, no hatred and no toxicity. Everyone just in a good mood. Media sites not reporting bad things happening around us. There seems to be too much violence. It should stop. It is not good for the media always reporting bad news. That's because negative news sell more than positive ones. Violence should never be profited of in my opinion. If only the news would report on nicer topics more than the negative ones, maybe it will result in a better minded society. I do wish that would come true. People in every religion must understand and respect each others culture. We have to accept them like family and respect individuality. That is also my wish. For everyone to understand and respect one another despite their differences in race, skin, opinion and beliefs. I would wish that God would give something to all the people in the world either financially or morally. There are many people in the world living under dire circumstances and they all need help much more than we do. I wish God really does something for them. Just make them all happy. No one should suffer from poverty without having food or shelter or clothing, the basic necessities of life. This so true as there is need for us to enjoy some level of financial prosperity. Just like the scriptures said, there is need for money since it is the means that a whole lot of questions can be answered as well. If world peace is not attainable then I would just wish for all of us to get along much better, small spats would be straightened out and not turn into a bigger issue, Tensions are now rising between the Chinese government and the western world because of their militarization of the sea by building artificial islands and as of yesterday they have detained a Canadian as what seems to be a response to a high ranking official of Huawei being detained by Canada as per the United State's request and brought to court. My hope is that this would all end peacefully. For me it would totally be peace for the world. I mean look on how much damage countries are doing to each other and how innocent people are being treated. I mean kids are being in situations where they absolutely DO NOT deserve the torture and destruction that is happening around them. It is so sad to see them in this war field. I absolutely pray and wish really that those who do not deserve to be in pain, destruction or in war fields to be safe and enjoy the happiness they need. I do agree. Humans are very selfish and they never care others. Those who are in high position, they oppress those who cannot stand. It's sad that it just us who destroy each other. Why we just love and help each other for the betterment of one self. My wish for this Christmas for the whole world is peace of mind. Having a stress free life is something worth living. Anything is possible when you have peace. There will be no argument or conflicts that resolves to violence. It will also lessen mental health problem. I wish for those people who are sick that they will be heal in God's grace. That their families will be able to secure solution to their problem. That there will be unity, forgiveness and love among their selves. Many are wishing for peace,but you have gone deeper to depict internal peace where you have mentioned healing of the sick.You are very right,one can not have peace in presence of disease.We need peace internally and externally. We can only have complete peace she we find solutions to our problems. Our mind controls everything. Having a good state of mind gives us happiness and peaceful living. One cannot be effective and efficient when the mind is disturbed. Our desires will not be achieve and our productivity will be compromise. It's always good to have peace of mind. Peace of mind would be great. Life without any stress would be a really good life to live. I would love for that to happen but I don't feel reality would allow it. Well stress or conflicts is always a part of life. Without it, we can't learn and life is boring itself. We will not be challenge to move forward and improve ourselves. We failed to do a lot of decisions. Having a peace of mind is the ability to find ways to solve problems and the ability to have positive outlook in life. I think if I would have a Christmas wish for the world I would choose to wish that the world would now be at peace were all nations are loving and giving in each other. I want that those countries that have some war and conflicts should be friends and settle their differences with each other so that there will be no reason for us to fight and kill each other just to have what we want to have in life. It is good to see that every people love one another where disputes and other problems had been set a side for us to have a peaceful world. I would have to wish for the love to grow in the hearts of men and women in the world. This is one thing that is essential when we are looking at getting to enjoy some good times as well. The world is developing at that rate and only by love shall we get to feel okay and happy always. I would wish that we all just loved each other like the people we all are. We spend a lot of time finding reasons to not love and relate with other people. We focus on our differences and we forget that we are all just people. The world would be so much better if we could forget our differences and see the one thing that binds us together. We are all people. We get born, and we die. True. This is a very wonderful wish. Do you think that this day will come? I hope that it will. Maybe not now but someday. As long as people wants this to happen then it will happen. My Christmas Wish to the World is Love Mother Earth, so that she'll love you back. Let's all protect nature and stop using fossil fuel that is killing the environment. And finally I wish for World Peace. Interesting discussion. Christmas is the season of love, joy and peace. This is the season where everywhere should be kind to each other. Use your holidays to love other people especially those people who need it. If I had one wish for Christmas it would be for people to love one another. I would want all the killing, hate and racism to stop. Thanks for all your Christmas wishes. If I were given a chance to make a wish or a prayer for the world, it would be that the world may be full of people who love God and love others. That the people in this world should fill this world with love, compassion and joy. That this world will unite for the greater cause. I want to see this world worshipping God in spirit and in truth. I would wish that there would be world peace. It is the "classic" wish but really needed by our world. How nice it would be if the world is peaceful? No wars in borders? It would be amazing. Christmas is religious.The Holy Bible records that during this season,a baby boy was born into the world.He is the prince of peace and wise counselor. If I were to make a wish,I'd wish for love and peace to prevail in the world,now and forever. World peace is the dream of course - so that would be amazing. I also think though that having people care more about our environment would be a great thing for the planet. I do think global warming is a real thing and I worry about the impacts it’ll have on future generations if we don’t all start thinking more about how we treat Mother Earth. My wish for the world is that I hope human beings set aside their very own personal interests for the good of the many. Lesser politics, more progress! My wish for the world is that, I hope that someday people will help each other to reach the top. It is sad to know that some people will continue to destroy you and pull you down just because they want to lift themselves up. Pulling someone down will never make you to be on top, you're just adding another reason for you to stay where you are. My wish would be peace and unity. I pray for the safety of the children and innocent people who were in the middle of the war and hopefully the government will help them. My heart goes out to the innocent children who are getting traumatized because of wars. No child deserves to get hurt from the misunderstanding of adults. I wish for their safety and good health. I wish for the world peace. That there will be no war. That there will no more hunger and poverty. That can only be achieved if the leaders on every country listen to each other and listen to the people's plea. I wish for the world to have peace and development. I wish that good and righteous leaders will rule well. I wish that corruption will be eradicated in their government. I think my wish for the world is that people's kindness would always remain despite the situation. A little more understanding for others and empathy would be nice as well. That we start saving the Earth since this is our planet and the only one we live in. There's more really but those would do for this year. I'll wish for the others next year! My Christmas wish for the word is to have a peaceful community that makes a better world to live. I prayed to have a peaceful heart and mind for everyone. A safer place for our children. Christmas is a season of giving, forget the bad memories and forgive our enemy. Christmas is my favorite time of the year I wish giving and loving remain in our heart every day. That's a wonderful wish. I think everyone of us what to achieve peace and safety of the children in the world. It would be happy world when everyone forgive and respect each other no matter what of skin color and religion they where in. I think it would be the goodness of everyone as there are a lot of evil works spreading around the world. I just can't stand how other people do such evil things to their own neighbor and God wants us to be united so what I want to wish for Christmas is a world peace. I can't wish for a World Peace when I am not a naive little girl anymore. In the last couple of years I realized how important it is to always have someone. So I just wish that nobody in this moment is alone. Whether you are with your dog, cat, lizard or a family I just wish you are not lonely. A Christmas wish that I would like to come true for the world is that people would know how to respect everyone and everything. This being in the form a human, an animal and the earth in itself. This would really help with the world peace. Especially compassion, as it also takes part in a friendly environment. This would lead people to become selfless. Then when everyone's selfless, we could all come to a point wherein we take care of our neighbors (everyone else). It is such a simple act to care and give to others. If everyone is like that, everyone will get their fair share.. However, it shouldn't end in just wishing. We all have the ability and capability to take action. Even a simple compliment to a stranger will do. What Christmas Song has the best Lyrics? What is your favorite Christmas Greetings? Best Christmas gift for a writer?